SHAKHTARSK, Ukraine -- New columns of tanks, trucks and heavy artillery rumbled towards the pro-Moscow rebel stronghold of Donetsk on Monday as fears grew of a return to all-out fighting in war-torn eastern Ukraine. Pro-Russian rebel military vehicles convoy move towards Donetsk, Eastern Ukraine, Monday, Nov. 10, 2014. On Saturday, Associated Press reporters saw scores of military vehicles moving near Donetsk and farther to the east. Many of the unmarked vehicles were towing artillery. 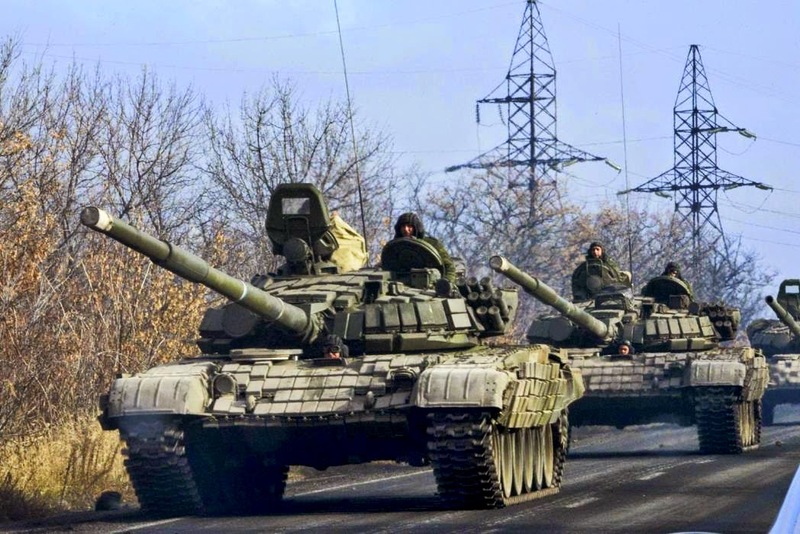 Ukrainian officials say rebel forces have received new weaponry and manpower from Russia. Moscow denies such claims. The Netherlands meanwhile held an emotional ceremony for the 298 victims of Malaysia Airlines flight MH17 which was shot down in July, focusing the world's eyes on the conflict in the ex-Soviet state. Pro-Russian separatist authorities in Donetsk said that the delayed removal of MH17 plane debris would begin Tuesday despite the fighting, but Dutch investigators say that no date has officially been fixed and that the situation is being assessed daily. Some 1,600 relatives and friends of the dead from 18 countries gathered alongside members of the Dutch royal family in Amsterdam for Monday's ceremony. Among the mourners were Dutch schoolchildren who laid flowers for classmates killed as they set out for their summer holidays on board the doomed flight from Amsterdam to Kuala Lumpur. "What if the holiday had started a day later? What if the plane had been late? What if I wake up and realise it was all just a dream?" Prime Minister Mark Rutte said in his address. "But there is no what if. Only the harsh reality of 298 dead." Ukraine and the West blame Russia for supplying the pro-Kremlin separatists with the missile that shot down the plane, while Moscow and the rebels have pointed the finger at Kiev's forces. The human toll of the conflict rose again Monday when three civilians and one Ukrainian soldier died as rebel shelling hit a residential area near a Ukrainian checkpoint in the frontline town of Avdiivka, some 10 kilometres north of Donetsk. Seven people were injured, according to the Donetsk region administration, which is loyal to Kiev and announced the incident. Intense weekend shelling around Donetsk and more armoured columns heading to the city have fuelled concerns the rebels could be gearing up for an offensive after weeks of localised skirmishes. An AFP journalist saw 28 trucks, six tanks and 14 howitzer artillery systems and two armoured personnel carriers driving through rebel territory around Donetsk on Monday. The West has repeatedly expressed concern at Ukrainian claims that Russian military reinforcements are being sent in while Moscow denies that it is involved in the fighting in the east. However, it openly gives the rebels political and humanitarian backing and it is not clear how the insurgents could otherwise have access to so much sophisticated and well-maintained weaponry. AFP journalists also reported sporadic shelling in Donetsk overnight, some 24 hours after heavy bombardments rocked the rebel bastion in some of the fiercest fighting there since the September 5 truce deal. At the MH17 ceremony in Amsterdam, 298 large candles burned in memory of the victims, 193 of whom were Dutch citizens, as flags flew at half-mast around the country. The remains of 289 victims have been identified but Dutch foreign minister Bert Koenders has admitted that the remaining bodies may never be recovered as the security situation around the crash site remains volatile. Russian President Vladimir Putin said shelling at the rebel-controlled location by Ukrainian forces was preventing a probe, during a meeting with Malaysian Prime Minister Najib Razak on the sidelines of Monday's Asia-Pacific Economic Cooperation summit in Beijing. Dutch investigators have made four visits to the site since the ceasefire was signed in September but The Hague says it does not know when they will be able to recover the wreckage of the plane. The conflict in Ukraine has sent relations between Western backers of Ukraine and Russia to their lowest levels since the end of the Cold War. US President Barack Obama met Putin briefly Monday in Beijing on the sidelines of the Asia-Pacific summit, a senior US official said. The two leaders, engaged for months in a standoff over the crisis in Ukraine, "only had a brief encounter where they didn't have time to cover issues," the official said on condition of anonymity. Putin this week faces a fraught burst of diplomacy at the APEC summit plus Group of 20 meeting in Brisbane, Australia. Australian Prime Minister Tony Abbott last month vowed to "shirtfront" the Russian leader over the downing of the jet, which was carrying 38 Australian citizens and residents. On Saturday, he said they would have a "very robust" conversation about the importance of Russia cooperating with the investigation. Russia's economy is labouring under European Union and US sanctions imposed over the conflict, with the ruble losing some 25 percent of its value this year. Putin shrugged off concerns over the ruble's collapse as the national currency rallied Monday. "We can see speculative moves in the exchange rate, but I think that will end very soon, given the actions taken by the central bank in response to the speculators," he said in Beijing.